It was a joke that fell flat. So after animal lovers howled, GoDaddy has pulled its Super Bowl commercial where a little, lost pup braves the elements, finds its way home, only to be sold online and shipped off to a new home. Danica Patrick, GoDaddy’s celebrity spokeswoman, drives the delivery truck. You could have heard the protest on Mars. Animal rights activists and animal lovers complained that the ad seemed to support puppy mills, which often connect with buyers online. Twitter slammers even had their own hashtag: #GoDaddyPuppy. 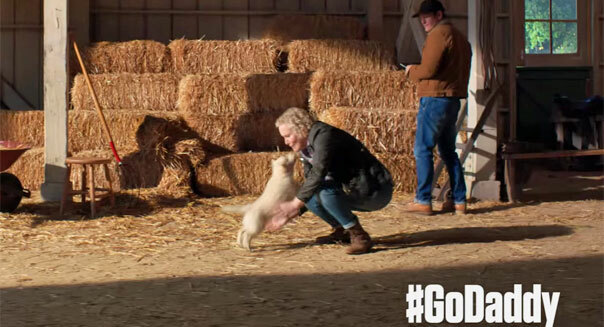 “Journey Home,” the ad starring a 9-week-old golden retriever named Buddy, was GoDaddy’s latest spoof on the Super Bowl commercial genre. After lampooning sexpot commercials in years past, GoDaddy decided to turn the tug-your-heartstrings puppy commercial on its fuzzy little ear. Take that, Budweiser, which reportedly also has a lost puppy ad in this year’s big game, and “won” the Super Bowl commercial war last year with it commercial about the love fest between a puppy and a Clydesdale horse. Well, back to the drawing board. Irving said, “You’ll still see us in the Big Game this year, and we hope it makes you laugh.” He didn’t reveal anything more about the commercial.